Backtrack has issued its first two releases. They are Drango and Trapeze/The Greatest Show on Earth. Please visit our online store to buy! Each release is a limited edition of 1500 copies. Backtrack was founded in 1980 in Brighton, East Sussex, on England's south coast. For the past 12 years we have been based in the historic town of Rye on the Sussex/Kent border, 1 hour from the Channel Tunnel and 1-1/2 hours from London. Backtrack is now based with our sister company, Grammar School Records, which sells all kinds of music, in the historic Rye Grammar School in Rye High Street. 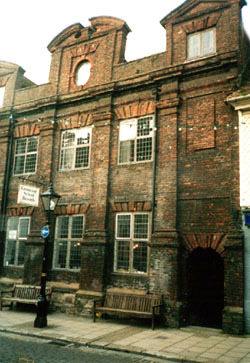 The Grammar School was built in 1636 by Thomas Peacocke, a local benefactor, and is of particular architectural merit. Since 1980 we have issued monthly catalogues, offering the best soundtracks on LP and CD. We now offer the most extensive soundtrack stock in the United Kingdom. We pride ourselves on the quality of the records and CDs we sell. All LPs are professionally cleaned before being offered for sale, and we give a complete guarantee on all orders. Backtrack is staffed from Monday to Friday 10.00am to 5.30pm, but personal callers are welcome seven days a week in the shop, from 10.00am to 5.30pm Monday to Saturday and 11.00am to 5.30pm on Sundays.